Wild: Gigantopithecus fibrarator is a strange creature. It is usually quite passive, but it has a very short temper when it comes to its personal space. Once another creature gets close, this gentle giant quickly becomes a rampaging beast. Best to give them a wide berth. Domesticated: In addition to being at home picking berries a tamed Gigantopithecus can be taught to harvest the fibers found on many island plants as well. It appears to be entirely content to pick at plants all day, eat the berries, and hold the fibers for its tribe. 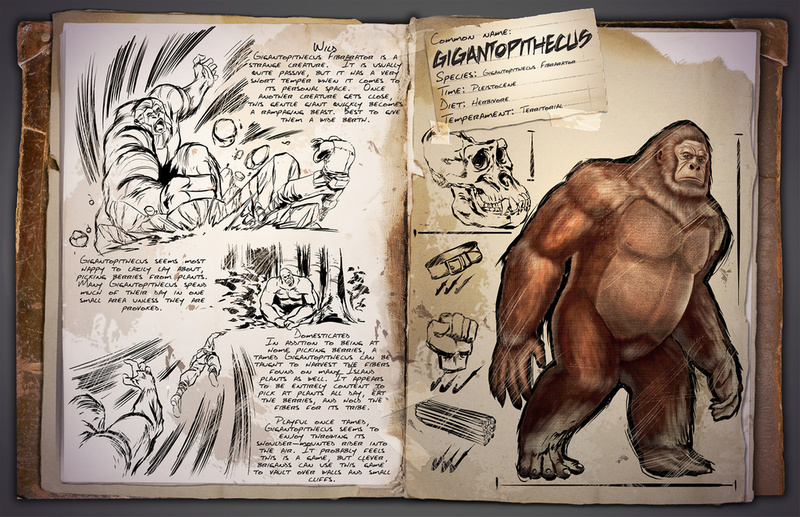 Playful once tamed, Gigantopithecus seems to enjoy throwing its shoulder-mounted rider into the air. It probably feels this is a game, but clever brigands can use this "game" to vault over walls and small cliffs. Known Information: Gigantopithecus seems most happy to lazily lay about, picking berries from plants. Many Gigantopithecus spend much of their day in one small area unless they are provoked. Are these available in the primitive plus version?